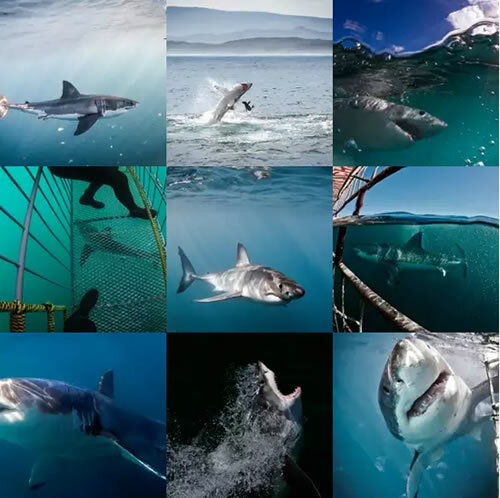 Great White Cage Shark Diving Tours from Cape Town: White Shark Ventures invites you cage diving with great white sharks in the aptly named "Shark Alley", near the fishing village of Gansbaai, South Africa. Gansbaai, is famous for its dense population of Great White Sharks and as a whale-watching location, making it one of the best Great White Shark Viewing locations from Cape Town. 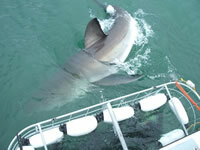 White Shark Ventures is the the oldest and most experienced operator in Gansbaai. They were also the founders of the Great White Protection Foundation and are members of The Shark Trust and the South African Shark Conservancy. Sharks are quite possibly the world's most feared animals. From the smallest sand shark to the enormous whale shark, they are sleek, muscled, and some are almost as agile as a dolphin. There is no doubt that they are the most evolved predators in the ocean. Row upon row of teeth and capable of sensing the blood of an injured animal from over a kilometre away, its not surprising that they are the most feared creature beneath the waves. And of them all, the Great White Shark is the most awesome. 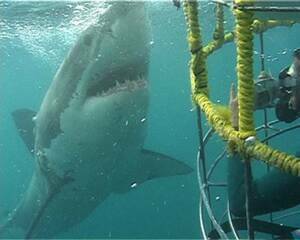 Experience Cape Town Great White Shark Cage Diving. 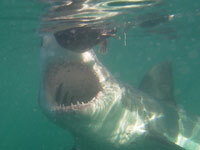 What we are offering you is the opportunity to dive and meet a Great White Shark, face to face - and on your own terms. Its an education and you will soon learn that this magnificent creature is in fact, highly misunderstood. It is a creature which should be more respected than feared. And if you spend some quality time with us, and with them, you will quickly learn why. (full day tour, incl. transfers via motor coach) - Should our transfers not be required, please deduct R 500.00 p/p, off the above rate.- July - Nov, land based whale watching is also included in Tour. Once anchored in the channel, we make use of a securely designed 6-man steel cage, which floats on the surface, with divers no more than 1m below the surface. Experienced divers are able to dive on scuba while inexperienced divers are able to enjoy the same experience on snorkel. Snorkeling is equally comfortable and safe. White sharks are indeed surface feeders, providing brilliant surface viewing from the safety of the shark-viewing deck of the boat. Our shark handlers are trained to bring the sharks close-up against the side of the boat, with the head and the jaws clearly visible. We are in possession of a valid White Shark Cage Diving Operators Permit (issued by government), enabling us to work within the Dyer Island nature reserve area (copy of permit available upon request). Only long-standing operators who are in compliance with certain safety regulations and code of conduct, are entitled to this permit. All our facilities are closely inspected by authorities on an annual basis, ensuring maximum safety for all our guests. (full day tour, incl. transfers via motor coach ) - (Rates valid from 1 Jan. 2019). Should our transfers not be required, please deduct R 500.00 p/p, off the above rate. July - Nov, land based whale watching is also included in Tour. Exclusive Shark Cage Diving Charters also available. Please enquire for rates. Highly recommended in combing a shark cage dive with Whale Watching!! Price includes: - Remember that experience is not essential. 14. Drop-off at Cape Town International Airport at no additional cost. (Upon request). 15. Various gifts and memorabilia for sale. 16. Purchase a DVD of your own personal shark diving experience, after the tour. * Door-to-door collection from the Cape Town metropolitan area. while the safety briefing and other formalities takes place. * Return to Kleinbaai harbour. * A light lunch is enjoyed while viewing the video of the day. A copy of your own personal experience is available after the tour. Please note: Due to tides and collection schedules, we can only confirm exact collection times at 16h00 the day prior to your tour. Remember that experience is not essential. Getting into the cage with the sharks around, is truly the most breath-taking experience you will ever live to remember. They are very curious though and often come close-up to the cage, taking a closer look at the diver. A personal, eye-to-eye encounter with this awesome animal, is guaranteed to get the adrenaline going! The cage is situated next to the side of the boat and once ready to take the dive, our Dive Master would assist the diver into the opening at the top of the cage. Once in position, the divers head would be no more than half a meter below the surface. A free-board of approx. 30cm allows the diver to rise to the surface and effectively communicate with the Dive Master on the boat. Snorkelers would secure themselves by holding onto the convenient cross bars, situated at the top of the cage. Diving takes place on a quick and effective rotational system, with 5 to 6 divers down at a time. Once the rotation is completed it will be repeated, therefore ensuring that each diver can take as many dives as possible. Time spent in the cage depends on weather/water conditions, shark activity and eagerness of each diver, but is usually approx. 20 minutes at a time. When does snorkeling / scuba diving take place? Scuba Diving is not always guaranteed since we work 10 km out at sea and only know what the shark activity and sea conditions are like once we arrive at the dive site. It is also known that during certain seasons we encounter sharks that are very cautious and are therefore easily frightened by sound, such as the sound of scuba breathing equipment. To avoid scaring the sharks off as soon as they arrive at the boat, we commence the diving on snorke first. Should the sharks become more relaxed and confident with having the divers around, we will then switch to scuba. However, diving on scuba is not guaranteed as it all depends on the types of sharks we encounter on each particular tour. It is obviously better to view sharks from the cage on snorkel, than not to get to see the sharks at all. Our tours run each and every day of the year, as Dyer Island is a good place to see the sharks all year round. The absolute best season is probably in our winter months, when sharks are particularly active in their feeding pattern. The following guide-line is based on tours we have done over the past 8 years and months may overlap slightly. Water temperatures vary between 16 and 20 degrees celsius during our high season, and between 10 and 16 degrees celsius during our intermediate and low seasons. Towel, warm weather proof clothing, sunscreen and hat, camera and binoculars, sea-sick tablets and dive card. 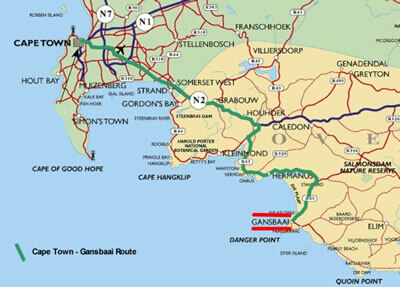 In order to assist you in getting around, we have provided a map of the southern Cape, with the route to Ganasbaai clearly marked, we have also provided directions from Cape Town to the meeting point in Gansbaai. (Please allow 2 hours.) Take the N2 Freeway past the airport and Somerset West. Continue over the Sir Lowry’s Pass towards Hermanus. After passing through the Houwhoek Valley and over the Houwhoek mountains, take the R43 left towards Hermanus. Follow the road through Hermanus and continue out of Hermanus again, towards Stanford. Once you pass Stanford continue for another 20 km, until you enter Gansbaai. As you enter Gansbaai you will be in the main road (police station on the right). Continue with the main road through the town, until you get to a stop sign indicating Kleinbaai/Blompark. Take a right turn here and continue all the way down this road for a few kilometers and over the last stop sign, until you see the ocean right in front of you. The road now naturally turns to the right and a few metres along you will see a large white double storey building on your right (opposite the slip-way). You will also clearly see our name “White Shark Ventures” in front of the white building. Enter through the front door and make your way up the stairs to the top floor, where we will await you. NOTE - If using a GPS – DO NOT TURN RIGHT AT DE KELDERS. This is just before Gansbaai. Carry on straight and the road will take you into the main road in Gansbaai. Our Lodge is situated in de Kelders, a prime land-based whale-watching area, and is only a stone-throw away from the ocean. 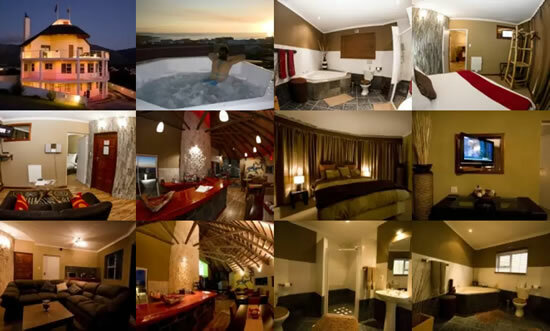 It has a very modern African feel to it and although rated 4*, has many 5* finishes. All suites have their own living room, bedroom and bathroom areas. Bathrooms have corner baths, walk-in showers, hairdryer and toiletries, while the living room boasts a mini-bar fridge, tea and coffee facilities, TV (Satellite), DVD and stereo. The bedroom has a king sized bed or two single beds if preferred. Free WiFi is available throughout the house. This three storey Guest House has a modern African feel to it and every care has been taken to ensure your complete relaxation and comfort. It has unique features such as; big screen television in the bar area, wireless hotspot and internet connectivity throughout. The suites, which consist of a bedroom, living room and bathroom, have all the little extras such as microwave, toaster, coffee / tea facilities, bar fridge, Television, DVD player, stereo, hairdryer, sewing kit, first aid kit, toiletries and more. Our breakfast menu includes delicious meals such as a full english breakfast, pancakes, health breakfast and the ever popular continental. We offer room service every day as well as a laundry service. We offer a stunning sea view from the top floor but all of our rooms except one are on the ground floor. After a long day out, sit on the balcony with a glass of wine to enjoy the sunset and stunning views over the bay. Our boat Megalodon II is one of a kind custom built Catamaran, especially designed and built for comfort, safety, speed and stability (minimizing sea-sickness). The engines of the vessel can trim completely out of the water making it a safe working and swim environment for sharks, not harming them in any way. Megalodon II is also the only vessel whose hull is completely filled with SABS approved foam making it unsinkable. Every year we conduct foam density tests to make sure the foam is still in tact. Our multi million rand vessel is specifically designed and approved by Naval Architects and SAMSA for ultimate safety and stability. Megalodon II is a luxurious vessel, setting the platform for redefined luxurious shark cage diving and viewing tours in South Africa. We also have all necessary medical equipment with oxygen on board in case of emergency, and our crew is medically highly qualified to administer and help any person in case of emergency. We have an emergency flow chart in the vessel in case of fire, a second medical boat and helicopter evacuation. We have a serviceable 54-man life raft on board. Although our tours are for adrenaline seekers, our emphasis is more on education and conservation of this misunderstood animal. By working with smaller intimate groups, it allows us to make your experience a more personal, educational and unforgettable one, with longer cage diving time and more photo opportunities in the cage and from our viewing deck. Our vessel has two designated private lockable change rooms on board with a toilet facility. We also have hand showers on deck. In the cabin we have two dedicated compartments where mineral water, soft drinks and snacks are on display during the duration of the tour. The benches on deck serve as perfect storing facilities for personal belongings of our guests whilst at sea. The sturdy staircase leads to the upper deck of the vessel offering fantastic unobstructed shark viewing and photographic opportunities. Our cage is architecturally specifically drawn, designed, built and approved with no sharp edges, therefore making it extremely safe and eco-friendly, not harming the sharks in any way during our tours. The cage is inspected on a daily basis and is inspected by government officials on an annual basis. Our galvanised steel shark cage can comfortably accommodate up to 5 divers. All diving equipment is provided free of charge and is tested daily. Upon arrival guests are issued with a dry bag, wetsuit and dive booties (towels can be rented). We have invested in purchasing over 70 wetsuits with 50 pairs of dive booties. These items are regularly inspected and kept in good condition. We are proud to confirm that we are the only company offering clean, sterilized wetsuits on all our excursions. We are also proud to confirm that we are the only company offering dive belts with weights to reduce the buoyancy whilst diving, as this is much needed to steady one-self when trying to capture the perfect underwater photo. We are the only boat in the shark diving industry with specially designed motors which lift completely out of the water, ensuring that the propellers do not harm the sharks in any way. Our boat, cage and life-raft are inspected on an annual basis, ensuring maximum safety for all our passengers.